Buz Cooper MD | Health Policy Explained: Telling The Truth, Busting The Myths. The New York Times has provided important insights about the factors related to dense aggregations of poverty. And, no doubt the lowest ranking counties by this measure are among the hardest places in America to live. By using counties as the geographic unit, however, it masks urban poverty and mistakenly concludes that this magnitude and intensity of poverty is “an overwhelmingly rural phenomenon”. The NYT study ranked Los Angeles County at #703 of 3,135 counties, well down in terms of poverty. But Los Angeles is an enormous county. For planning purposes, it has been divided into Service Planning Areas (SPAs) to allow the Department of Public Health to develop more relevant public health services for residents in different areas. SPA 5 (West LA) and SPA 6 (South LA) share a border, and their epicenters are only 15 miles apart. 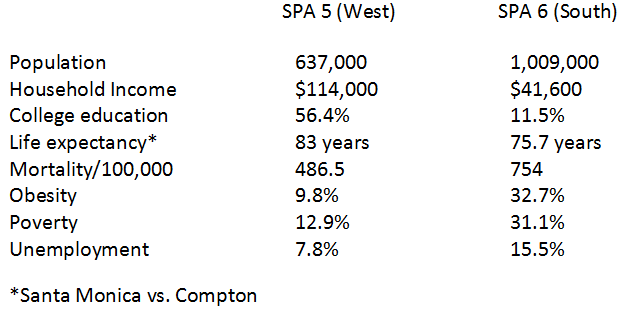 While it’s not possible to calculate precisely where this would be in the NYT list of counties, wealthy SPA 5 (West LA) would probably be in the top 10, while poor SPA 6 (South LA) would land somewhere in the bottom 100. It is interesting to note that poor SPA 6 (South LA) has many more people living in poverty than any of the rural counties in the bottom of NYT list. The NYT article concludes, “Clay and Los Alamos Counties are part of the same nation. But they are truly different worlds.” The same can be said for SPA 5 and SPA 6, two districts within a single county, which differ every bit as much a Clay and Los Alamos Counties. The lesson is that urban poverty must be analyzed in units much smaller than counties and, conversely, when instead, districts as different as SPA 5 and SPA 6 are aggregated and averaged, the results can be misleading. Other examples of embedded urban poverty and its impact on health costs and outcomes are demonstrated in our recent article, Poverty, Wealth and Health Care Utilization: A Geographic Assessment .